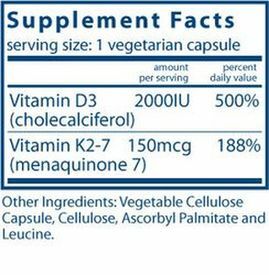 Vitamin D3 (cholecalciferol) and Vitamin K2-7 (menaquinone) work synergistically to help maintain bone health. Vitamin D3 helps maintain healthy serum calcium levels by encouraging intestinal absorption and minimizing urinary excretion of calcium. Vitamin K2-7 supports healthy bone mineralization by acting as a cofactor in the carboxylation of osteocalcin, allowing calcium to bind to this protein in the extracellular matrix of bone. Vitamin K2-7 may also support healthy cardiac and vascular functions. This form of Vitamin K concentrates in the tissues of the arteries, where it aids in carboxylation of Matrix Gla Protein to help maintain normal calcium metabolism and support healthy vascular elasticity. If you take Coumadin® (warfarin) or other prescription blood thinners or are pregnant, consult your physician before taking. © Copyright 2019 Professional Supplement Center, LLC, 5441 Palmer Crossing Circle, Sarasota, FL 34233. All rights reserved. Local time is 4/25/2019 1:55:01 PM.